I cannot even begin to tell you just how excited I am about today’s post! 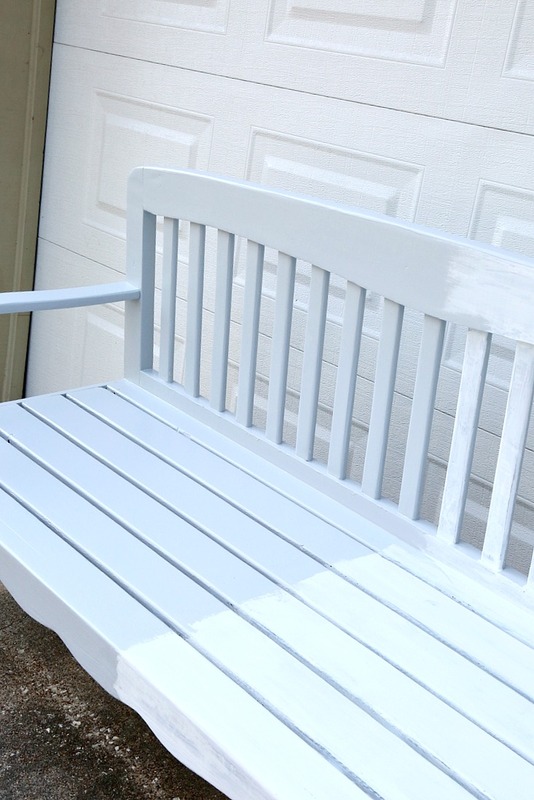 I recently teamed up with PPG Timeless to be one of the firsts to try their new one-coat coverage, paint+primer paint called PPG Timeless, before it hit the market. I was so blown away by this paint ( now available at Home Depot) that I’m excited to finally tell/show you guys how this paint is gonna be a serious game changer when it comes to our paint projects! I don’t want to sound to paint nerdy/technical in this post but to better explain the significance of this new paint, I wanted to share a little background for those of you not familiar with PPG. Stick with me on this and I promise you’ll understand why in a moment. PPG has been more on the professional paint/coatings side of the paint industry for 130 years. In other words, big companies hire them to develop highly durable industrial type paint for unique uses. For example, PPG creates paints for airplanes, space shuttles, submarines and more large commercial type situations. Of course, these paints have to withstand the toughest of all elements and durability. Nothing has to be more durable than the paint on the space shuttle on re-entry to the Earth, right?! So, PPG decided to create a paint for us on the consumer side using some of the same leading PPG technology and innovation found in their commercial paints/coatings. 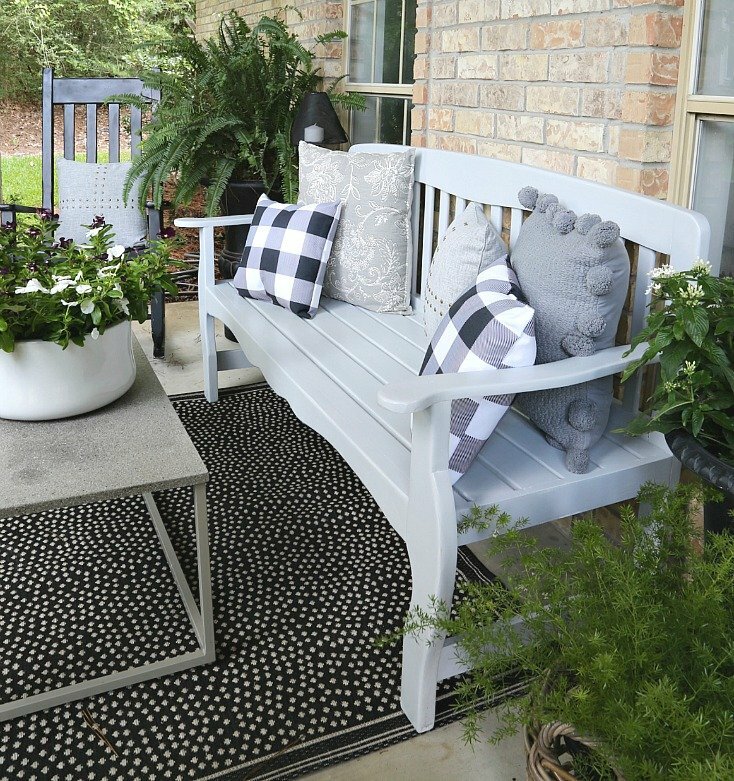 In addition, they wanted to incorporate one-coat coverage, primer+paint all-in-one, UV protected and the most durable consumer paint on the market but still a gorgeous finish. When PPG contacted me and told me about their new paint and asked me to try it, I figured it would be good because of PPG’s history of making the best professional paints/coatings. However, after I tried it, I realized that they went beyond what I could imagine and they created a consumer paint that simply doesn’t exist on the market. As a paint geek, I realized as I used it start-to-finish that PPG just took paint to a whole new level with the new Timeless Paint. That’s why I’m so excited for you guys to try it! It’s really a fool-proof beautiful paint! So let me just show you! 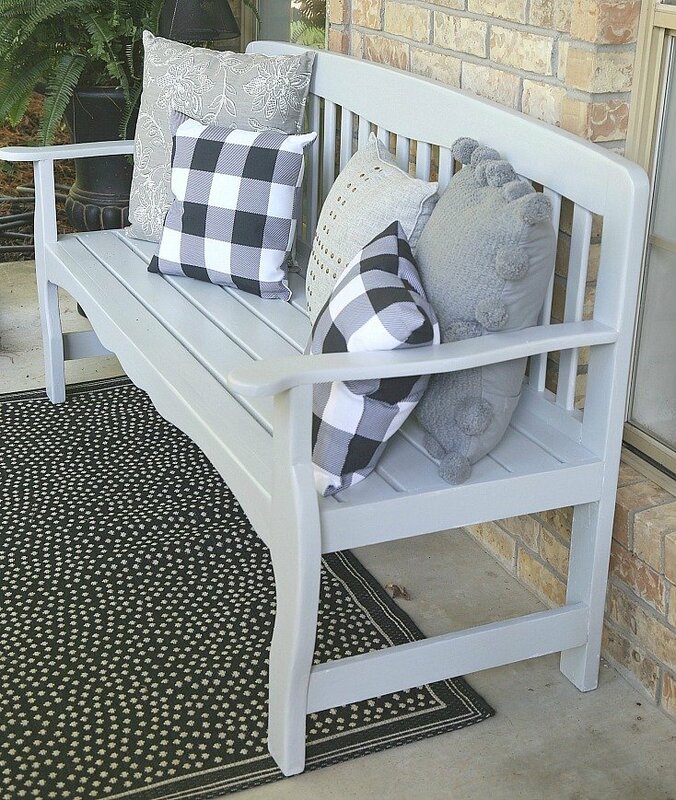 The first project that I did to try out the new PPG Timeless was painting my front porch bench using the PPG Timeless Exterior Paint. PPG Timeless comes in both exterior and interior. Here is the before picture of my bench. I had planned this year to just get rid of this bench and get a new one because it was in such bad shape. It had 5-7 coats of paint flaking off from over the 15 years that I had it and it was just so beat up from our extreme Texas heat and humidity. I decided that this would be the ultimate exterior paint project to put this new paint to the test and see if I liked the paint. I was especially curious to see what the finish looked like. 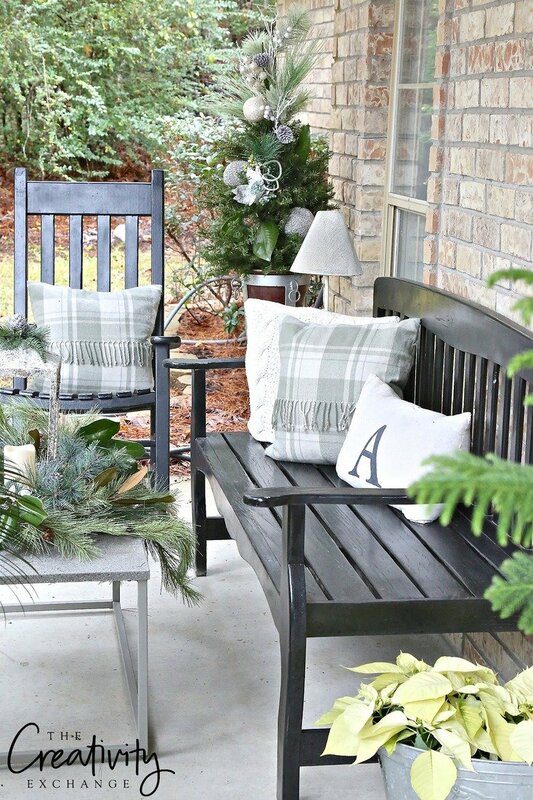 Here’s a shot of my bench last Christmas and if you look closely, you can see where the paint is flaking (especially on the seat) and the grains of the wood splitting/separating. That’s what extreme humidity does to wood. I had to sand the bench because I had so many layers of paint flaking off. 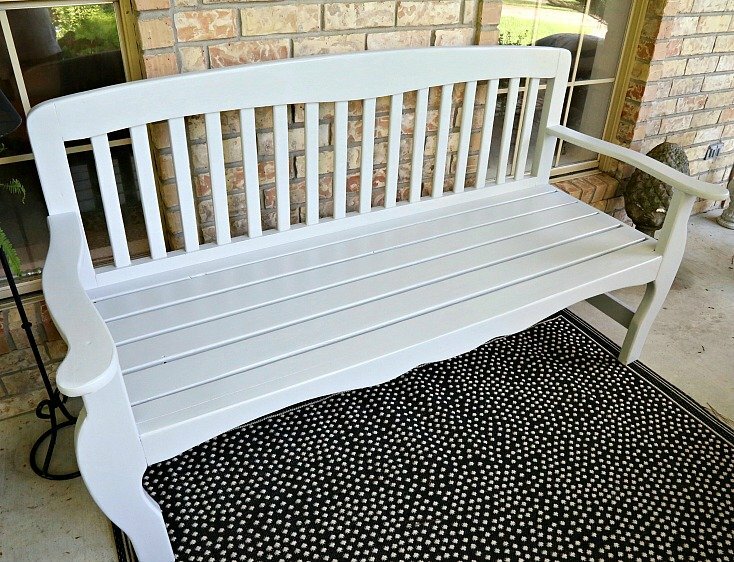 I did go ahead and prime the bench but after talking with PPG, it was unnecessary with PPG Timeless because it’s truly a one-coat coverage, primer+paint all-in-one. The funny thing is that this paint is so good that PPG Timeless for exterior is only available in water-based. Say what?! For those of you in Texas or extreme weather states, you know that we wouldn’t consider using anything but oil-based on our exteriors. So this really had my attention! 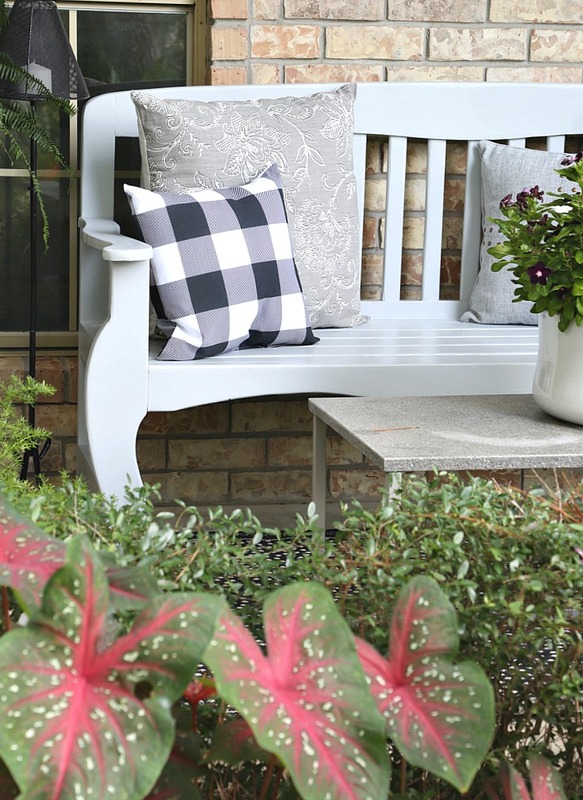 PPG Timeless has over 1,000 beautiful colors to from and I picked Silver Reflection for my bench. So as I began to paint the bench and applying the paint, I was immediately surprised. The application of the paint is just like butter! Very smooth and easy going on and I could go over areas multiple times without getting that gummy texture on my brush and paint finish like I would normally get when I paint in 100+ degree Texas weather. Really, I should say the texture was really more like painting with a thicker baby oil. Just smooth and consistent and unlike any exterior paint I have ever used. I was worried when I started painting that like most traditional exterior paints, I would go through a bunch of brushes because of the heat. Exterior paint normally goops up in that situation when I’m painting when it’s so hot and humid. No goop at all! In fact, I stopped painting multiple times to go in and cool off and went back out. No new brush needed and I could go over where I previously painted and no sludge or goop that always happens with other exterior paints. 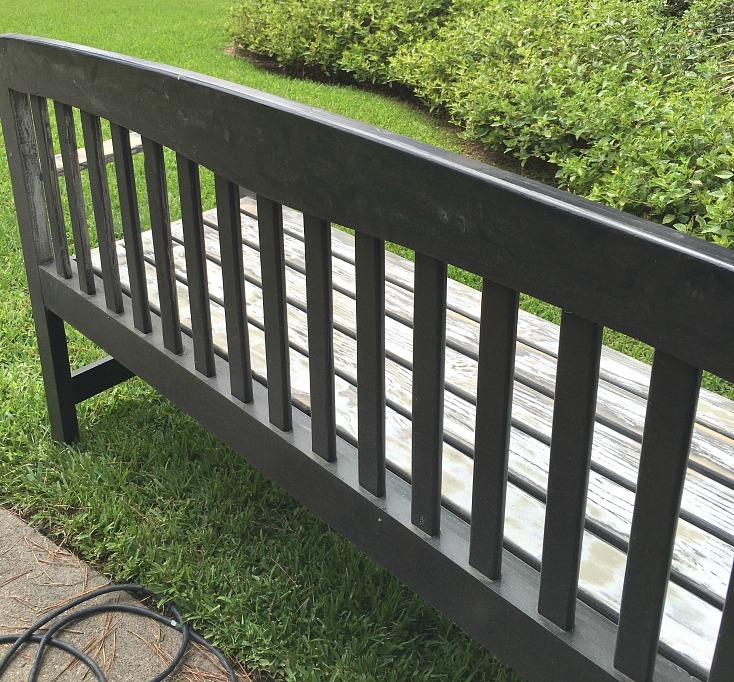 I painted that whole bench on and off (to go in and cool off) in just a couple hours with one coat! It was actually a joy painting because the paint is seriously so easy and smooth going on. 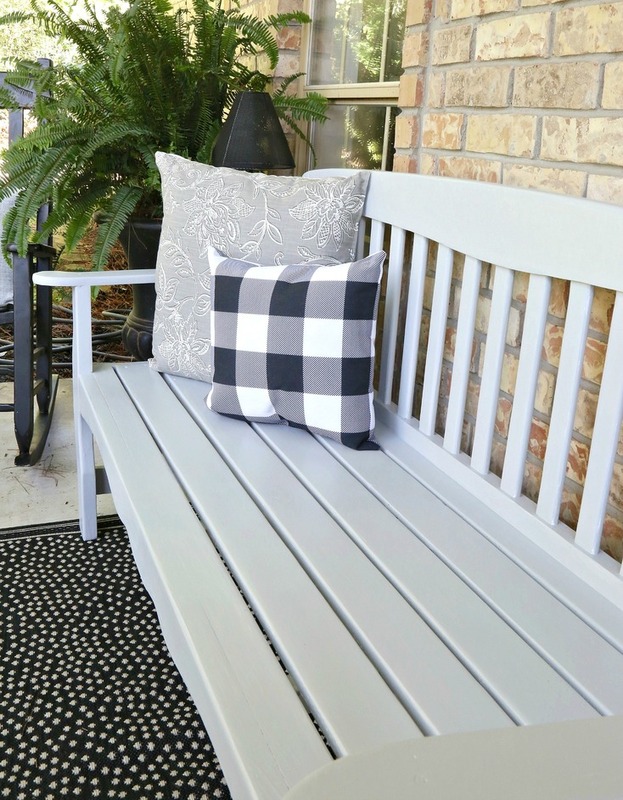 I kept thinking if it’s this easy to apply on my bench, imagine how easy it would be hanging form a ladder painting a garage, front door or house trim. I was also thinking how much less paint would be needed for larger exterior projects. That also means less money! So here’s what it looked like when I was finished! Can you believe this paint gave me that smooth butter finish in one coat? It’s really such a smooth and even finish. 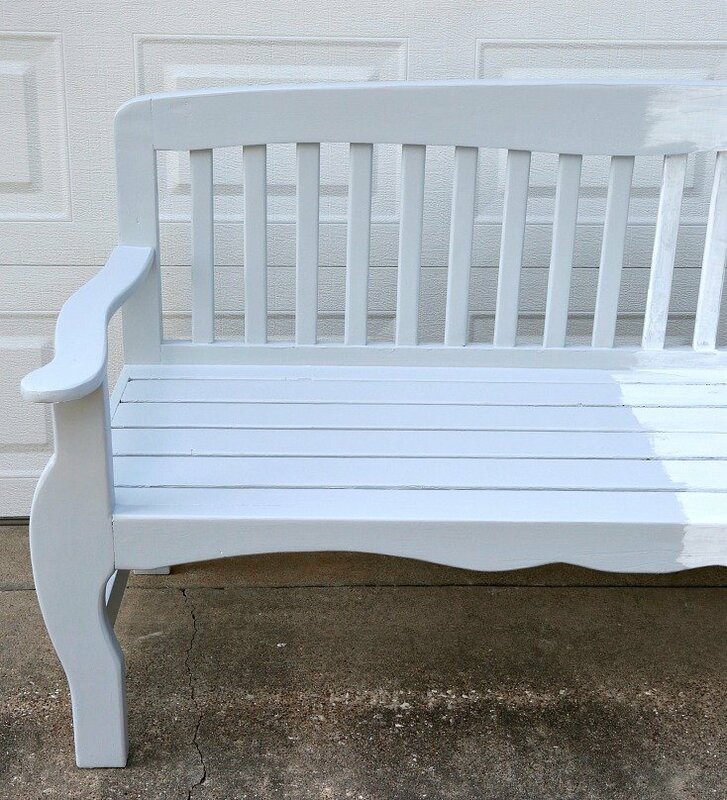 The bench looks brand new and what was really interesting to me is that the smooth matte finish (I used satin) looked just like something that would take multiple coats and wax buffed for hours to achieve! 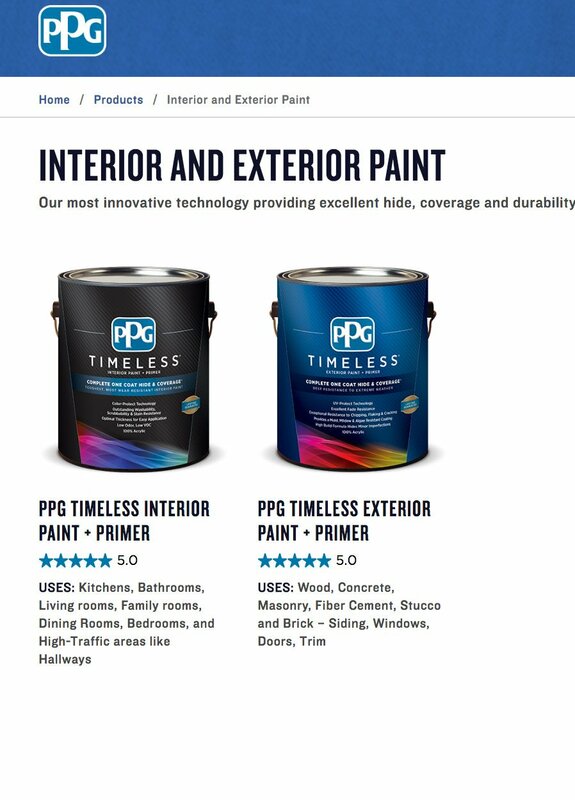 As far as exterior durability, I found out that PPG Timeless paint uses the same automotive-grade ultraviolet (UV) and gloss retention package used by automotive manufacturers. So the paint won’t fade in sunlight or dull over time. 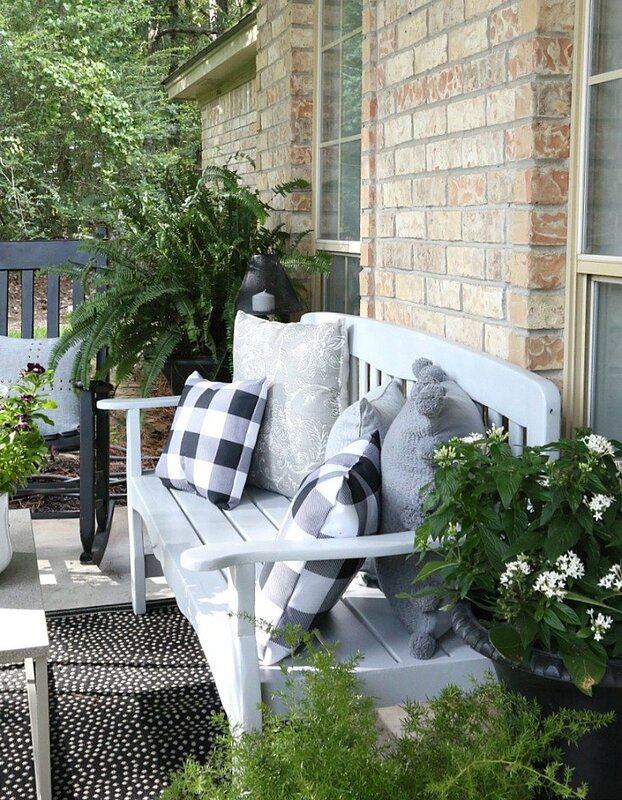 The PPG Timeless exterior paint is so durable, it can be used on masonry (patios), stucco, brick, fiber cement and of course, siding, trim, etc.. I am especially excited that PPG Timeless has outstanding washability, scrubbability and stain resistance, which is another huge plus! Not only is this paint now the most durable paint on the market, it’s also easy to clean and scrub. Nice! The new PPG Timeless exterior comes in flat, satin and semi-gloss and the interior comes in flat, satin, semi-gloss and eggshell. As you’ve figured out, I’m pretty excited about PPG Timeless and have already used their interior paint in my dining room! I’ll be sharing that project with you guys next week! I can’t wait for you guys to try this paint! Trust me, just try one project with it and see the gorgeous finish and how smooth this paint goes on! You’re gonna love it! You can get it now at your local Home Depot. Wow! That finish looks amazing! This just might be the paint that encourages me to finally tackle painting my kitchen cabinets. Thanks for sharing! I just found out that I need to clarify what I told you Trisha about using PPG Timeless on your cabinets! 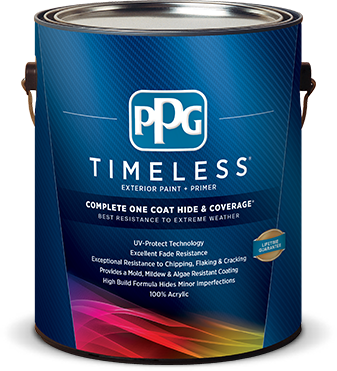 PPG Timeless paint is a universal product that can be used on many interior surfaces like walls, doors and trim. However, it is not specifically designed for cabinets. The best idea is to reach out to PPG’s Technical Services and discuss whether it is a good fit for your project. The number is 1-800-454-3336. Home Depot sells this now!!! I’ve been so disappointed in Beh$ paint that I started shopping elsewhere for my paints. I’ll certainly return now that I have a PPG source. Very excited! 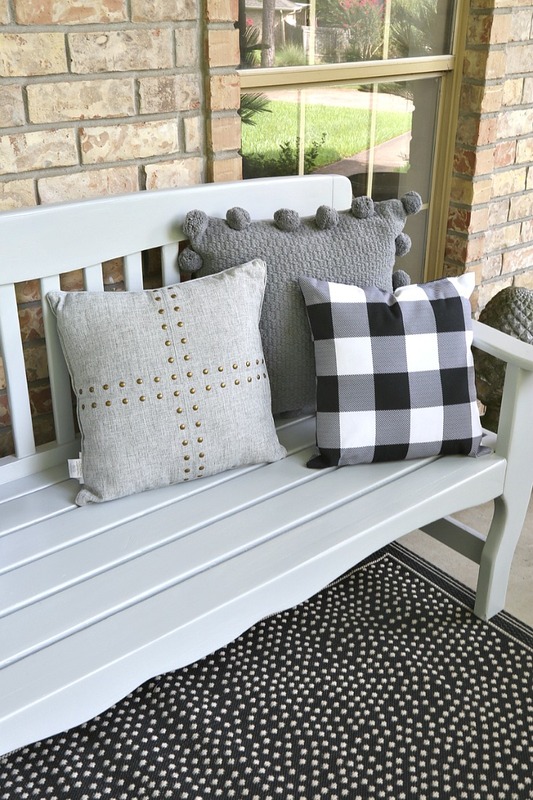 Wondering if this would work on metal porch railings. I checked with PPG and this is what they told me about painting metal surfaces.. “All common metal surfaces (ferrous metal, aluminum, and galvanized) should first be cleaned and primed with an appropriate primer before the application of PPG Timeless Paint. We recommend Glidden Gripper Primer (also made by PPG) and available at The Home Depot”. It looks beautiful. To clarity, you are saying it doesn’t require a top coat to protect it? Thanks! Nope! This paint is so durable that absolutely no top coat, wax or anything is needed! Paint was created to be durable enough to withstand the most extreme weather conditions. Also, I forgot to mention that it also self-levels and will natural smooth out during application and brush marks disappear within about 15 minutes! Just one coat and you’re done! Well heck! This could be a game changer for sure then! I am a little scared but I’ll try it on a piece of furniture and see how it goes. It’s the “no top coat” part that worries me! Would this paint work on a metal door? Wanting to paint my front door that gets the morning sun, currently it is black and very faded. Yes!! However, because it is metal, you will need to do just one extra step. This is what the folks from PPG advised: “All common metal surfaces (ferrous metal, aluminum, and galvanized) should first be cleaned and primed with an appropriate primer before the application of PPG Timeless Paint. We recommend Glidden Gripper Primer (also made by PPG) and available at The Home Depot. 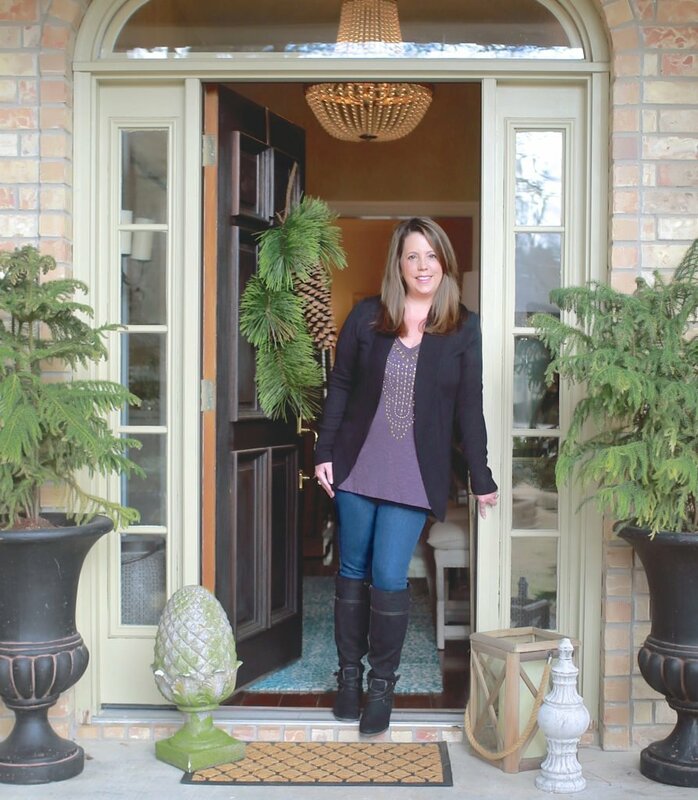 Just in time for my exterior rockers! Thank you. Off to Hone Droit to see if they can mix it in the Benjamin Moore color I need! Hi Cyndy! 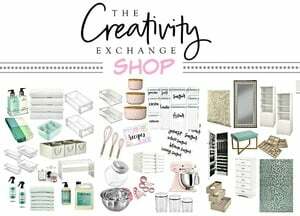 Wow what a post about a game changing paint! I was ready to buy a sprayer and start a whole house cabinetry painting marathon with multiple coats of primer, sanding etc. hmmm. Do you know anyone that has used this product on cabinets? With a sprayer or just brushes? Thank you so much for sharing your creativity! I enjoy your site so much! Thanks so much for your response! I think I will try a bathroom shelf unit with a brush and see how it turns out. The unit had 2 doors so this will be a good test. I think spraying for the kitchen cabinet doors would be best but I’m a newbie so still researching and learning. Back to color choice which is where I get stuck! Your color posts are SO helpful! Hi Dale! I need to clarify what I told you! I should have waited to respond to you until PPG helped me answer your question. My apologies… Here is what they told me. “PPG Timeless paint is a universal product that can be used on many interior surfaces like walls, doors and trim. However, it is not specifically designed for cabinets. The best idea is to reach out to PPG’s Technical Services and discuss whether it is a good fit for your project. The number is 1-800-454-3336”. Thanks Dale and sorry for the confusion! No worries Cyndi! I searched their site yesterday for any mention of kitchen or cabinetry and did not find any references. But doors and trim did lead me to wonder if cabinets would be an option too. Thanks for your additional research and the update. Good advice! Unless I find posts on successful kitchen projects I’ll stick to the tried and true. ? I’m too green to be a tester. My husband is nervous enough with my plans to spray everything except him and the cats! Just to clarify, absolutely no primer? I’m getting ready to paint my kitchen cabinets. I have new beadboard on the ends so that’s raw wood and the cabinets themselves are not high quality, laminate only. Can I paint these two surfaces without priming? I’m excited to give it a try! How does the finish compare with the finish of Farrow and Ball paint? Also, what is the price comparison with regular Indoor paint? Ironic that you ask me that question because as I was painting with this paint (I used both exterior and interior), the rich pigmentation and even finish reminded me so much of Farrow and Ball. I think the finish is actually even prettier if you can believe it! It’s seriously THAT good! Love this color! I’d like to paint my dressers this color with interior paint. It has the original finish on them. Do I need to lightly sand them beforehand? Beautiful. Silly question, I know you said you can paint your outside trim, etc. on house. What about using the paint to paint the outside of the whole house, not just the trim,how will it hold up. I live a block from the ocean? Also, can you have colors custom mixed like other paint that Home Depot does? Hi! I was wondering what finish you used (I may have missed it, sorry if so! ), and what type of brush you used? This is so exciting and I can’t wait to try it. Thanks for sharing. I’m looking forward to seeing their different colors. I’ve done some googling, and can’t figure out if this is available in Canada yet. Anyone know? 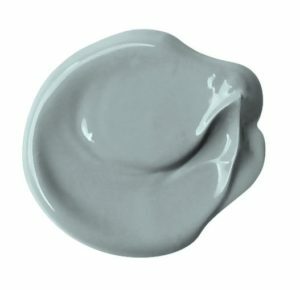 Can you paint furniture with this paint? You said you went back and forth to painting over a few hours. So how long does it take the paint to dry? It sounds like a long time. I have had white poly wood furniture for 24 years. I now live in a log cabin and would love to paint it red. The furniture is made out of recycled material ok jugs. Would this paint work? Bought some Timeless stain with An “oil based technology” — best stain product since true oils were outlawed. Applied to treated Cedar fence, looks amazing!! ,since it has some oil product in it — it seals the wood like nothing else i found so far. Closest thing to a traditional oil stain, vet very low odor, hardly smells at all and i cleaned up with odorless mineral spirits with considerable ease. The waterbased stains can’t compare to the quality finish i got with this product. Applied to treated Cedar fence, looks amazing!! ,since it has some oil product in it — it seals the wood like nothing else i found so far. Closest thing to a traditional oil stain, yet very low odor, hardly smells at all and i cleaned up with odorless mineral spirits with considerable ease.